I took a leave from work today because of a Royal Rumble in my stomach (which is added motivation for me to stick to my diet, but I’ll save the diet musings for another post). My little guy was home today as well because of an activity in DLSZ, so I was really looking forward to having some precious mother-son bonding time. We spent the morning being lazy, which is always fun. I wanted to prepare a nice lunch for the kiddo since it would be just the two of us sharing a meal. 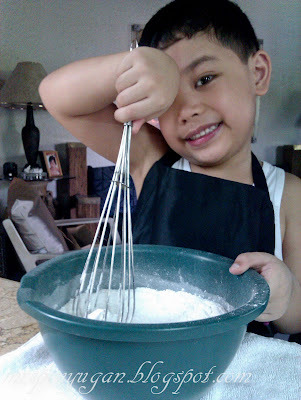 I asked him what he wanted to have and he cheerfully replied, “Pancit”. Unfortunately we didn’t have any ingredients for pancit, and I actually don’t know how to cook the stuff. Since I’d been craving for Pinoy style spaghetti for a few days now, I decided to make that instead. It was actually my first ever attempt to make pasta sauce from scratch. After some research online and a few tips from my cousin Zita, I bring you my version of Pinoy Spaghetti. It still needs some adjustments and tweaking, but for a first timer, I didn’t do so bad if I do say so myself. At least Tristan thinks it’s the best spaghetti ever. 1. Cook spaghetti noodles according to package instructions. Once cooked, remove noodles from the pot and set aside. 2. In a medium sized saucepan, heat oil and saute garlic and onions. Add ground beef and cook until light brown. Throw in carrots, Vienna Sausage and beef cube. Simmer over medium heat until bouillon is melted. Season with pepper and fish sauce. Pour in enough soy sauce to add color to the meat. 3. Pour spaghetti sauce and banana ketchup over the meat mixture. Mix well and bring to a boil, stirring constantly. Once the sauce is boiling, lower the heat then add the granulated sugar and condensed milk. Mix well until the sugar is completely dissolved. Continue to simmer until the sauce is as thick as you want it to be. 4. Remove sauce from heat, pour over cooked noodles, put cheese on top. Serve and enjoy! 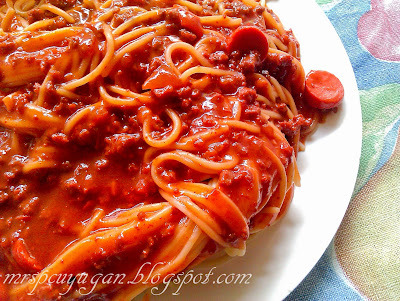 Yummy yummy Pinoy Style Spaghetti! 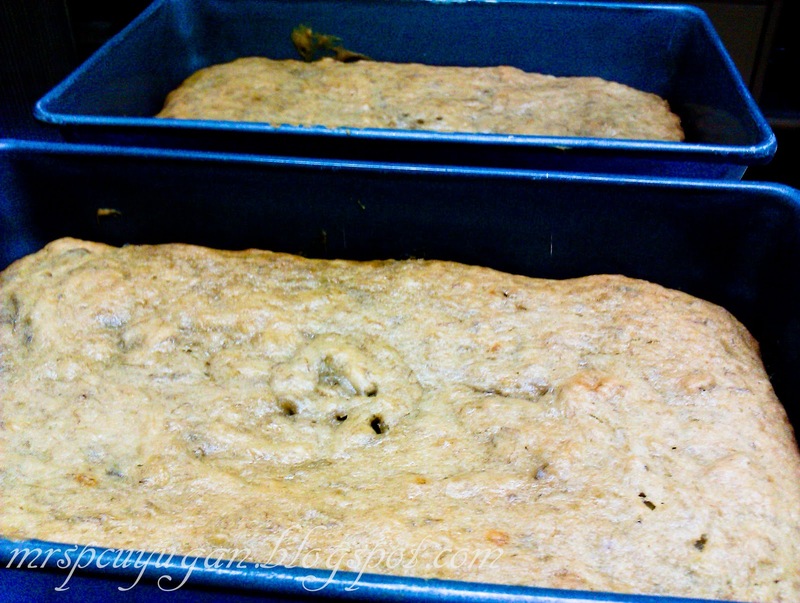 Since Tristan had so much fun helping me prepare lunch, we decided to make another batch of banana bread for our afternoon snack. I have a whole lot of bananas in the freezer leftover from my Herbalife Shake days. 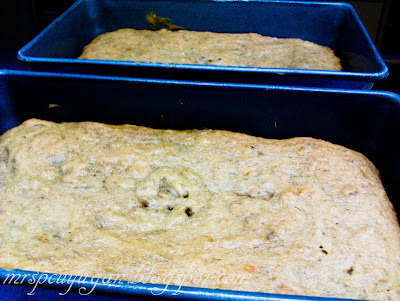 My mom can’t wait to get rid of all of them and reclaim her freezer space, so a new batch of banana bread is always welcome in our house. 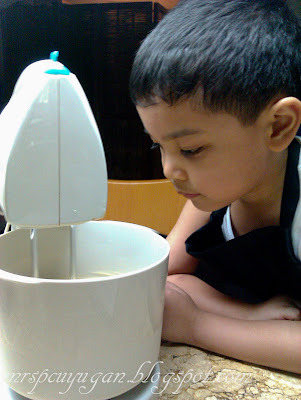 The kiddo had so much fun mashing the bananas, mixing the dry ingredients with a whisk, and watching everything swirl around in the electric mixer! 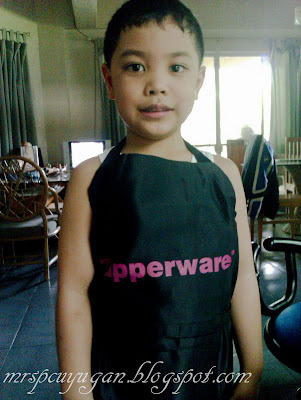 Of course, the little guy insisted on wearing an apron, so I let him borrow the one from Tupperware that I got from my CCA Kitchen Discovery Course day at Oceana. The finished product. Yummy as always! 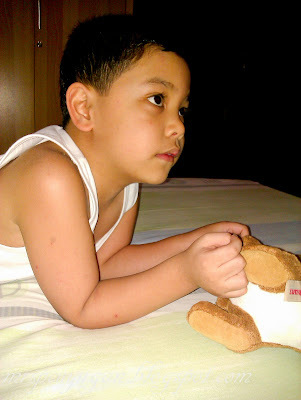 I really enjoyed my day at home with Tristan despite the discomfort of the rumbly in my tumbly. After an afternoon spent in a hot kitchen, we decided it was time to clean up and cool of in our nice air-conditioned room with The Many Adventures of Winnie The Pooh. didn’t know you could add condensed milk! my sister-in-law just cooks the beef and noodles then slathers everything with a bottle of jufran banana ketchup. i’ve yet to make my own. i love “ketchup spaghetti” — i actually prefer it over tomato sauce spaghetti. Hi Connie! I’ve found that the condensed milk makes it creamier and adds a nice milky sweetness to the sauce. 🙂 I love ketchup spaghetti too. Actually, i love any kind of spaghetti! Thanks for the visit!